Iceality adds tranquility, distinctiveness to your garden. 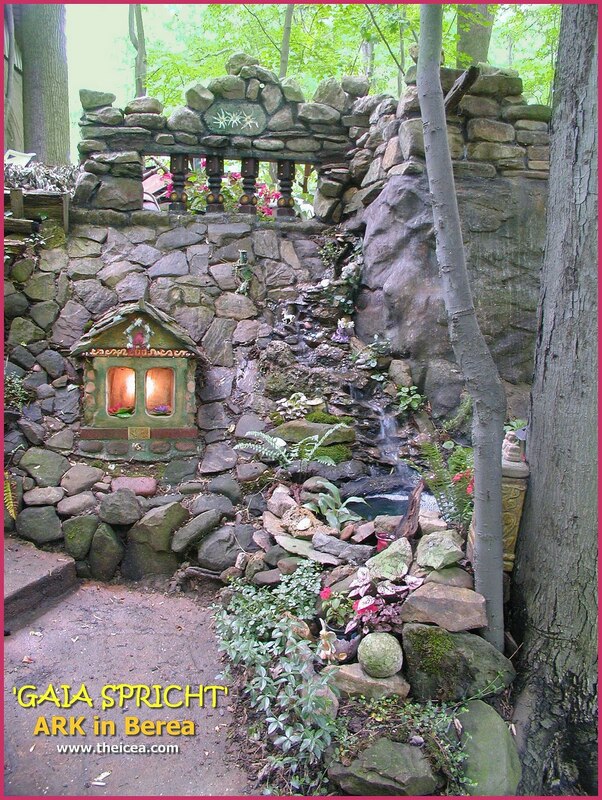 Long before you step into the ARK in Berea’s rear garden you hear 'Gaia Spricht' - A cascading fountain covered with fairy land art: unicorns, pixies, gnomes. 'Gaia Spricht' is built into the Walderuin and easily visible from anywhere in the garden. Designed by American Cultural Ambassadors David and Renate themselves, 'Gaia Spricht' is one of just a few fountains in the garden and a source of constant entertainment and pleasure. "I wanted something that brought me something of my homeland of Austria," Renate says. " And I couldn't be happier." 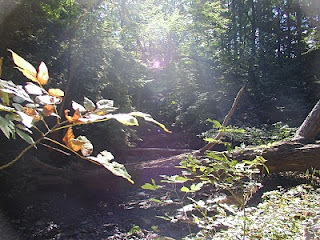 'Gaia Spricht' is German for Gaia Speaks and refers to Gaia as the Spirit personifying Mother Nature. The Ancients believed in the idea that the fertile Mother Earth itself is female, nurturing mankind. 'Gaia Spricht' symbolizes that living organisms and inorganic material through water are part of a dynamic system that shapes the Earth's bioregionalism sphere, and maintains the World in a fit environment for life. At the ARK in Berea, every Earth Day, in a measure to heighten awareness of environmental concerns, the 'Gaia Spricht' water is dyed red to symbolize that water is the lifeblood of the planet. the garden, started in 1976 is an official wildlife habitat and a model and inspiration for future sustainable landscape designs worldwide: According to Natalie Ronayne, executive director of the Botanical Garden, In 2010, The Sustainable Sites Initiative already has the support of the U.S. Green Building Council, the nonprofit trade organization that expects to incorporate the landscape guidelines and performance standards into future updates to the LEED rating system. LEED -- Leadership in Energy and Environmental Design -- is essentially a third-party certification program that has become the nationally accepted standard for design, construction and operation of sustainable buildings. Bringing art into your garden with Iceality is a perfect way to personalize your outdoor space, whether you buy something that catches your eye, make your own or commission a piece - gardens, art and iceality are natural companions. For the Jakupca’s, connecting with their roots for a major piece in their garden seems fated. Their travels to the olde world bought back many antiques and collectibles that are ideal for an outdoor centerpieces. Renate soon decided to have David create a fountain that would dominate without overwhelming her garden. 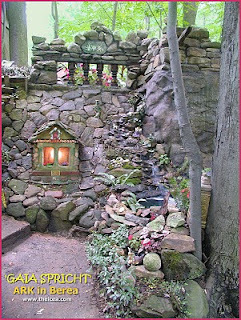 The Gaia Spricht’s inclusion of a fairyland reflects Renate’s hopes the planted garden would attract the little people as well wildlife from the woods. 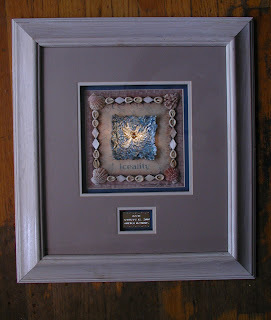 The piece also has a number of custom-made pieces that David made himself. The artist also included their 6-year-old dog, Mickey, allowing him to help on making some imprints in the path. "I didn't want just anything," Renate says. "I wanted something specific, something personal that made me smile and David did it. It's very peaceful and it makes the garden look bigger than it is." A quicker way to bring environmental art into your garden is by commissioning a carved wood work. David, a self-taught sculptor whose famous International Center for Environmental Arts (ICEA) “Pieces of Pelee” and “Endangered Spaces” Exhibits have been featured in United Nations Exhibits overseas. "I just went for it, in the beginning" he says. David uses wood from fallen trees and unusable stumps from seashores and woods to create one of kind outdoor and indoor environmental art. He does commissioned pieces, but this art form is also entertainment to create a sculpture in mere minutes. David often did demonstrations for awed audiences. His pieces are somewhat sentimental, taking you back to those long days of summer on the beach with the family all there. "When you see the works, you kind of remember those days," he says. Although he uses a variety of wood, David prefers driftwood. He likes the texture and appearance, and there's plenty of it to be found along the Lake Erie shoreline. He starts with a large hunk; the wood's shape dictates the subject. "I'll go in thinking my carving is one thing," David says, "and then something else — will just appear." He says his work has become more precise in the past seven years that he has been carving Peace Stones for the Worlds Children Peace Monument (WCPM). The Ambassadors are gearing up for a Labor Day weekend trip to participate in the dedication of the Rising Sun, Indiana Peace Stone. Utilizing iceality, outdoor art has moved far beyond the garden gnomes and the plastic flamingos. Welcome into the Universal Circle of the Ambassadors of Peace ! 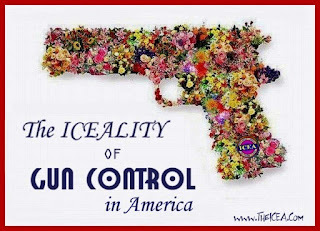 to create a core of Peace between all the advocates of Peace. a same Soul, a same Heart, a same Body, a same Universal Family of Peace”. ARK in Berea: The first Worlds Children Peace Monument (WCPM) Peace Stone of the 2010 peace season was unveiled this Memorial Day at the ARK in Berea. 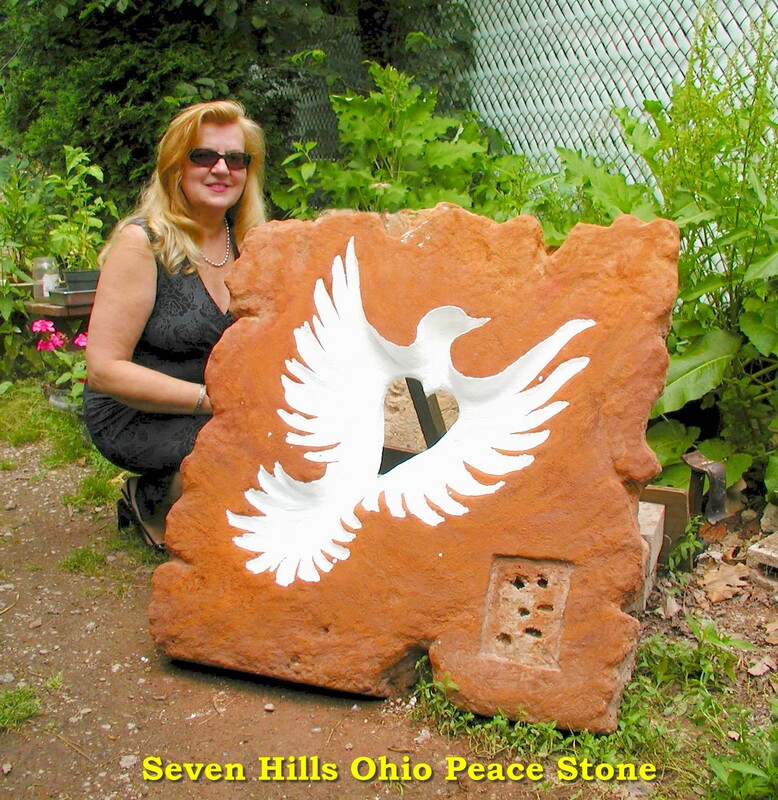 Dubbed the Seven Hills Peace Stone, it will be erected in Seven Hills, Ohio by Mayor David Bentkowski later this summer. Ambassador Renate said "I am enthusiastic as ever about working with Mayor Bentkowski because of the way he has helped his city, but beyond the overall economic impact, he is most fervent about the power of the arts to awaken children's creativity. This works well with International Center for Environmental Arts (ICEA) WCPM goal which aims to make iceality, arts and culture a major component of neighborhood revitalization and urban renewal nationwide. As the WCPM program gains support it will involve many other federal agencies and public and private collaborations". The Seven Hills Peace Stone still needs the 'special touch of a child' to be completed. This touch will be indelibly made in the lower right part of the stone. 'HAITIAN ICEALITY' - is the understanding of the relationship between the Haitian people, their culture and environment while cultivating a sustainable global culture of peace. -- The brown weave is surrounded by a blue mat as a symbol of isolation in the Caribbean. The natural weave and shells are a representation of the flora and fauna of Haiti. -- The Peace Stone is the Universal Symbol of Living Peace a representation of the Worlds Children Peace Monument (WCPM). -- The Peace Stone Colors are Blue and White - the United Nations colors - symbolizing the UN workers who died in the line of duty. -- White Dove is the symbol of WCPM. 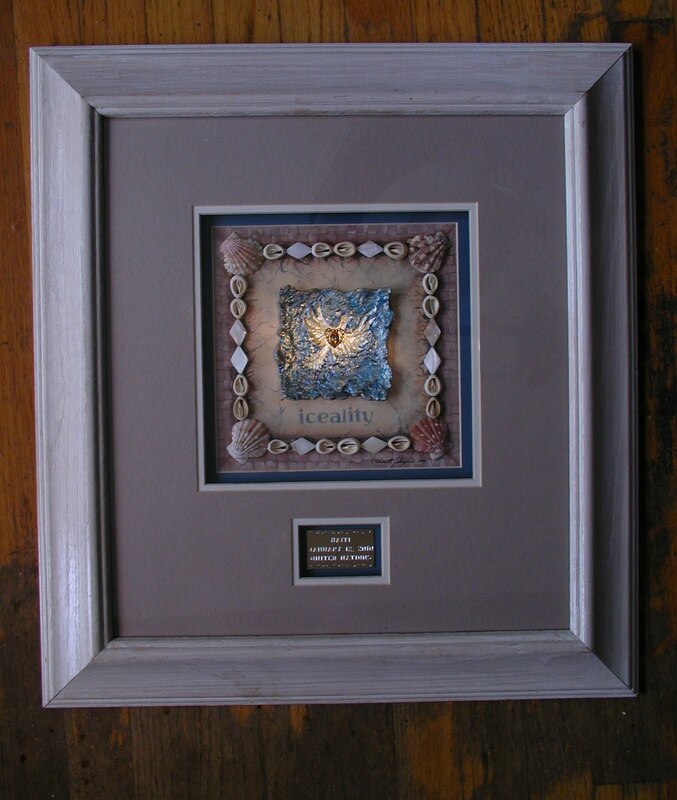 -- The Dove’s ‘Heart of Gold’ is a symbol of the generosity of all the people of the world helping out in this crisis. At the core of the heart and artwork is a colorful gem inscribed with a map of the Haitian area. "The ARK in Berea has made the Greater Cleveland Area is the home of the Environmental Art Movement. And Environmental Arts has been recognized as the indigenous art form North East Ohio. ICEAlity inspires architecture for ALL Living Things and can be called a Cleveland Artists Foundation. 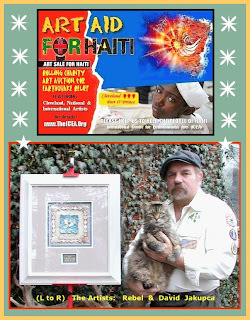 ART AID has the ability to actually help make a difference in the situation in Haiti and I just can not using this sustainable initiative to help make a difference in the future of the country. I would also have my artwork 'Haitian Iceality' made a memorial for 101 employess of the United Nations 2* who were killed eight weeks ago in the Haiti earthquake, the largest one-day toll in the organization’s history." Said David Jakupca, American Cultural Ambassador. *1 - When this part was painted at the ARK in Berea, to accelerate the drying process, it was left on the floor near a heater vent to dry while I ran some errands. Later we found Rebel, our adopted cat from Berea Animal Rescue, had climbed into the warm wet paint and made some additions to the painting himself then used it as a catnapping place. He has done this before, and upon review, as Cultural Ambassador, I decided to leave the natural ”corrections” Rebel had made to the final painting. their Environment through the Arts to promote a sustainable Culture of Peace"